With Pointe Profile®, candidates no longer have to wait for recruiters to start the screening process. 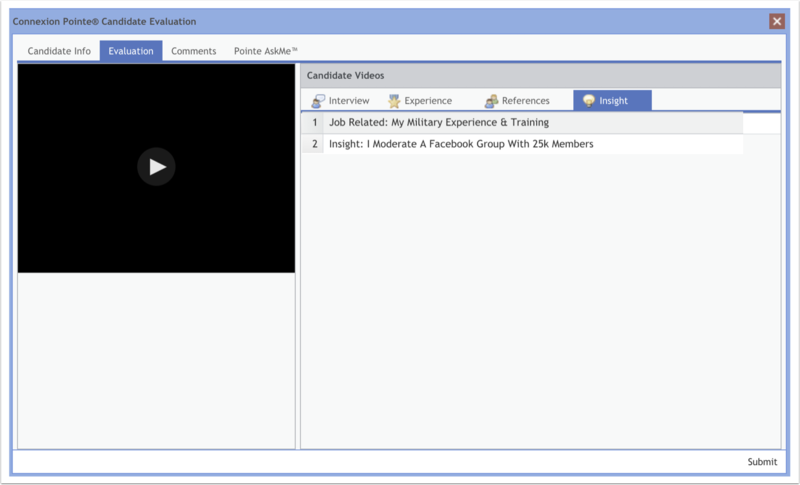 Candidates can use our self-service video interview tool to record themselves and share their interview with targeted recruiters while providing a clear pathway for verifying the content presented. Lowering recruiters’ workload and costs (without sacrificing quality) creates a unique opportunity to stand out and a strong incentive for recruiters to take a look. Know which interviews are being seen. The best jobs are not advertised. Our work log is easy to use. Recruiters and hiring managers want to learn as much as they can about you before they engage. So why not provide a link to a job-related screening interview in your resume and cover letter at first contact? You can with Pointe Profile®! In fact, you can even deploy a different interview for every job you’re pursuing, and easily manage them all from the same dashboard. Creating your interview is easy! Choose Your Interviewer and Language(s). 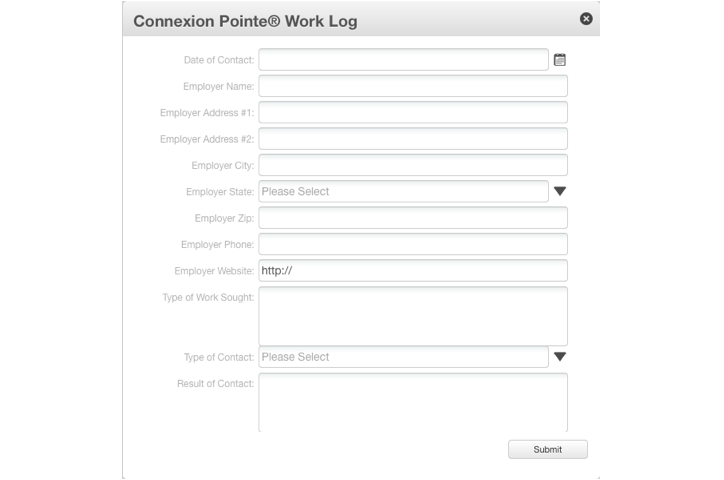 Connexion Pointe® features simulated face-to-face interviews. Choose male or female avatars from multiple ethnicities and languages. American English and Mexican Spanish are currently supported with more languages to come! Pointe Profile® supports professional screening, student admissions, and exit interviews. 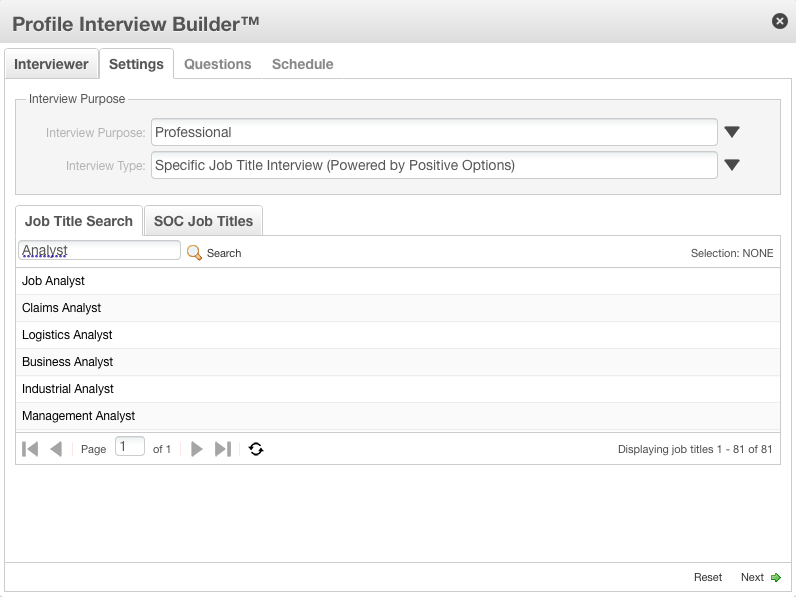 For professional interviews, select from 6600+ job-titles based on the U.S. Standard Occupational Code. For student admissions, undergraduate, MBA, post-graduate, medical or dental school interviews are supported. 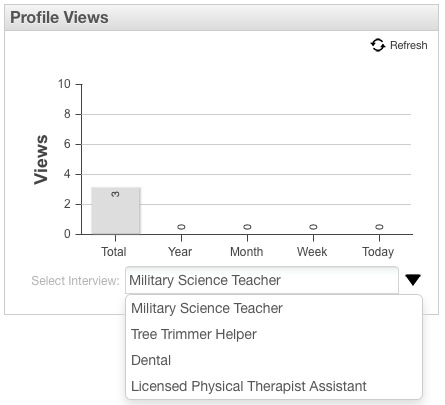 Based on your title Profile Interview Builder™presents a list of behavioral characteristics called competencies or soft skills based on your job title. Your interview is composed of questions that give you an opportunity to display these skills by describing your past experiences. Go Full Contact at First Contact™. 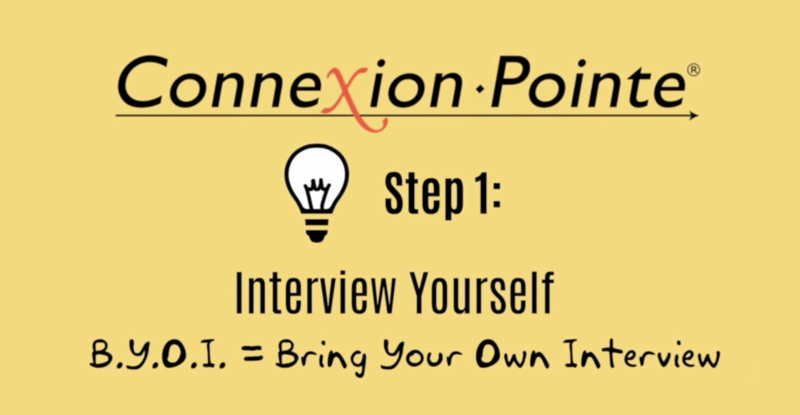 At Connexion Pointe®, we recommend planning for when your resume lands in front of the hiring manager. If they like what they see, a convenient link can speed up their due diligence and confirm your commitment to teamwork before you’re on the team! Remember, this is their first experience with you! Make it easy and exciting, and you might make an ally. The power of video combined with commonly sought after screening information makes Pointe Profile® a powerhouse for introducing yourself. The 8 items in the Pointe Profile® are designed to inform and empower recruiters with relevant, in-depth, and job-related information. The convenient interface keeps the recruiter interested and prevents information overload. With Pointe Profile®, recruiters come away with more answers, fewer questions – and an excellent reason to engage you directly! Every relationship starts with an exchange of basic info. Name, address, phone number, email address, position sought, and a photo to get things rolling. The resume has well-documented flaws. Nonetheless, it remains the primary tool to begin the exchange of screening information. Here, your resume is stored in PDF format. Clicking the link opens the resume in a new tab or window for secure download, printing or transfer into recruiters’ candidate management and resume parsing systems. Your Pointe Profile® Interview displays here. 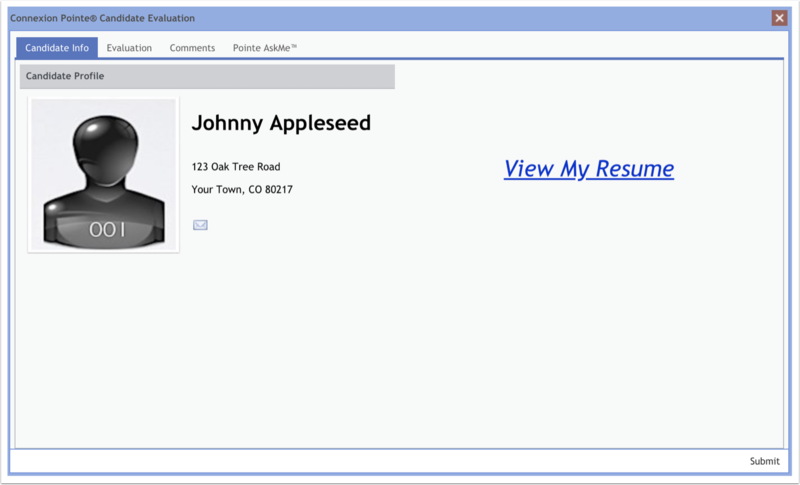 With the Profile Interview Builder™, you can create virtually any kind of interview for literally any purpose. 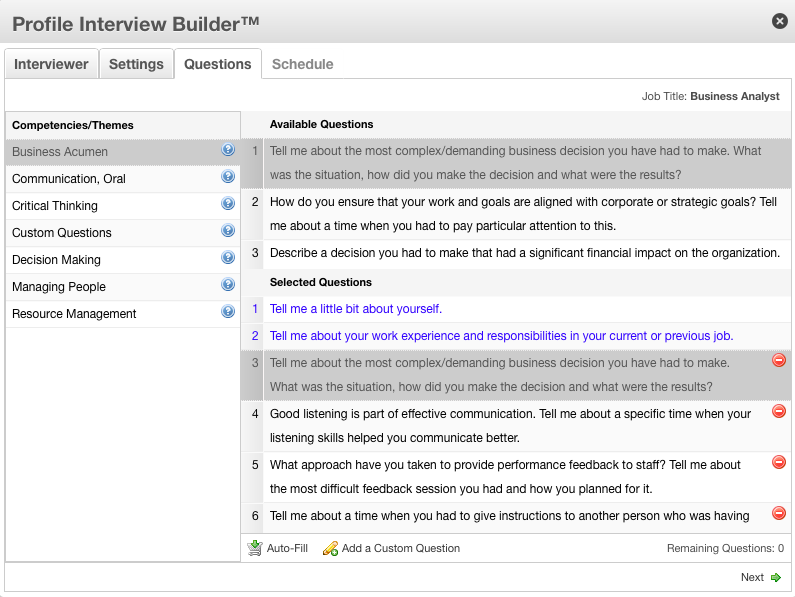 Use our guided question database or build a custom interview entirely from scratch. Recruiters will find your interview valuable and insightful – even though they didn’t create it! The interview questions are presented in a convenient video playlist so recruiters can go directly to specific questions and not forced to wade through a bunch of useless material. 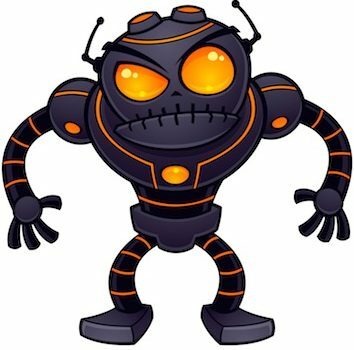 You also retain precise control over who has access to your data and you can stop an interview from being shared at any time. Having your interview link in your resume will put you miles ahead of the competition but can you do more? 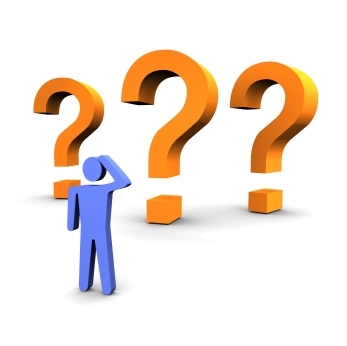 Consider this: What critical question regarding your experience do you want recruiters to ask you? Don’t wait or hope for them to ask! Why not create a 1-2 minute slideshow highlighting your previous work experience, export it as an MP4 video file and upload it to this playlist? You could usePowerPoint®, Keynote® (or any number of presentation tools) The Experience tab is where you can display these short videos. This optional tab is where you can present video testimonials from co-workers, bosses, networking contacts, and clients past or present. Recommendation letters are great, but getting a testimonial straight from the source is a lot more compelling! You already have that smartphone with the high definition video camera in your pocket, so put it to use in your job search! 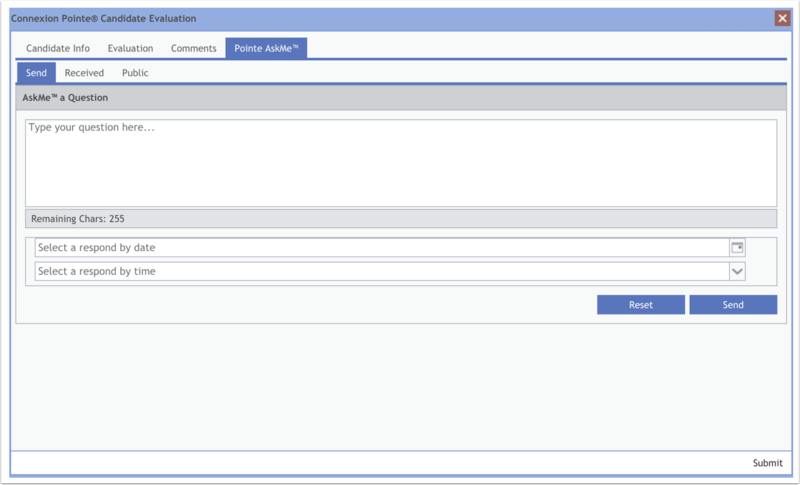 Like the Experience tab, the Insight tab (optional) is a place for you to present videos of unique or unrelated characteristics deserving professional consideration. You might be an accountant by day and an experienced helicopter pilot on the weekends. You might even be a Grammy Award-winning bassist who also invented an innovative online video interviewing solution. Insight offers a view of your other great talents while keeping it professional. Pointe AskMe™ is our built-in text-based communication system. Recruiters always have follow-up questions, and Pointe AskMe™ is ready. The recruiter types their question and gives you a deadline to answer it. You view the question while logged in to your account and respond appropriately. Frequently asked questions and your responses can be made public to speed things along with other recruiters. Pointe AskMe™ creates several convenient advantages, but it also facilitates excellent record keeping for everyone involved. Getting past Applicant Tracking Systems (ATS) is not the only pathway to landing your dream job. Many experts like Lou Adler, Forbes, and Business Insider estimate 50-80% of the best jobs are never advertised and that networking is your best pathway to landing one. Pointe Profile® is the ultimate tool for your networking strategy and standing out! Including a Pointe Profile® interview link in your resume and cover letter accelerates their due diligence and demonstrates teamwork before you’re on the team. 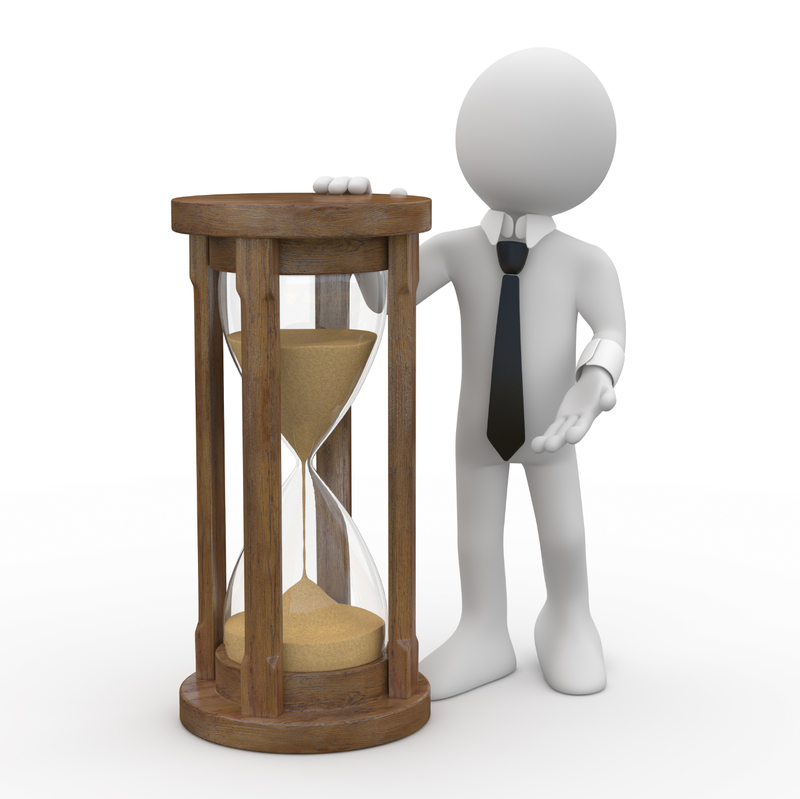 Most importantly, recruiters can choose you in minutes instead of days or weeks. You’ll be crossing the finish line while your competitors are still sending emails and applying online! Know Which Interviews Are Getting Traction. 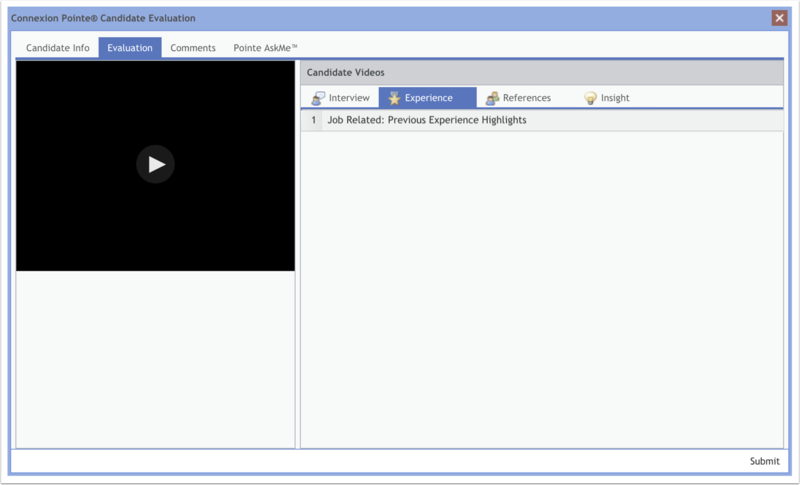 With Pointe Profile®, keeping up with the number of views your interviews get is easy. 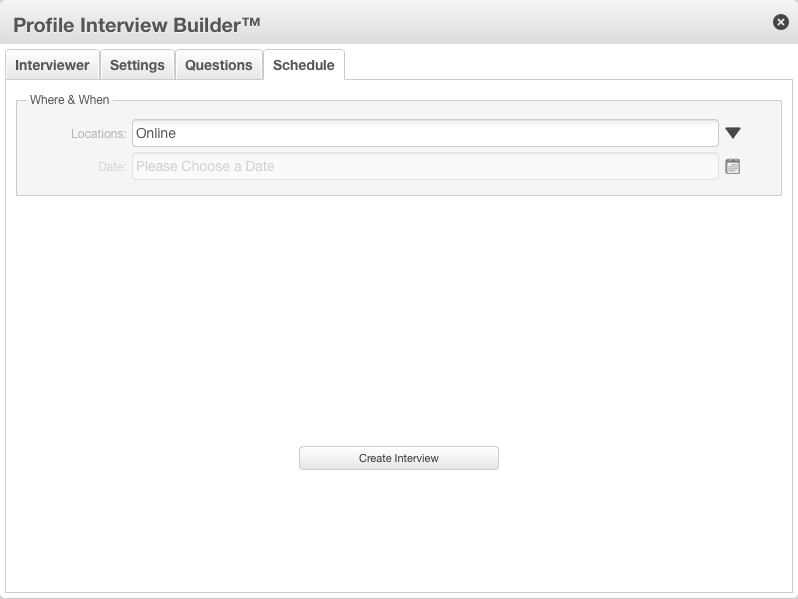 Just select an interview to view the information! With Pointe AskMe™, recruiters can ask you follow-up questions in just a few clicks. You’re immediately notified via an alert so you can respond fast! Connexion Pointe® University is a free collection of world-class training videos accessible from every Pointe Profile® account. Learn how to execute excellent interviews on and off camera. Access our knowledge base to learn how to create an outstanding multimedia curriculum vitae. Video is clearly becoming the standard medium of communication and with Pointe Profile®, adding video to your job search has never been easier! Keep Track of Your Work Contacts. 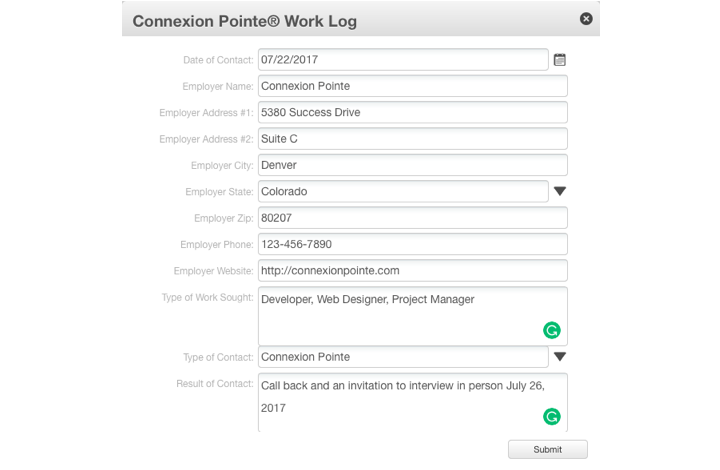 With Pointe Profile®, keeping an accurate record of your work search and follow-up history is easy. (move the slider to the left in the photo). Just enter the enter the information and click “Submit”. Records can be exported in PDF format. Except for the $1 signup fee, your Pointe Profile® account is entirely free! Use the account forever with no additional fees. None. Nada. Zilch. Zippo. Free. You have nothing to lose and everything to gain!